No-needle-knitting for all! Whether you are new to the wonders of this fascinating technique, or an experienced loomer, here are more than 30 projects for you to try your hand at. Designs include simple hats and scarves, handy tote bags, baby blankets, toys, beads, holiday makes for all the family, and more. 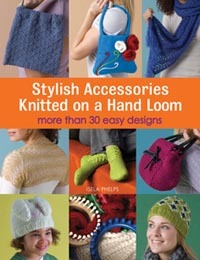 A comprehensive technique section covers everything from casting on to cabling, and there is a whole chapter on embellishing your knitting with ribbons, beads, and embroidery to create that individual designer look. Clear and simple instructions throughout the book will guide you through each design step-by-step, and it is packed with helpful hints and tips.